In this article, we take a look at what we think are the top options for email marketing and marketing automation in the Salesforce ecosystem. We will also discuss just using Salesforce for email marketing needs as an option. Marketing Cloud by Salesforce is probably the most advanced email marketing and marketing automation solution. 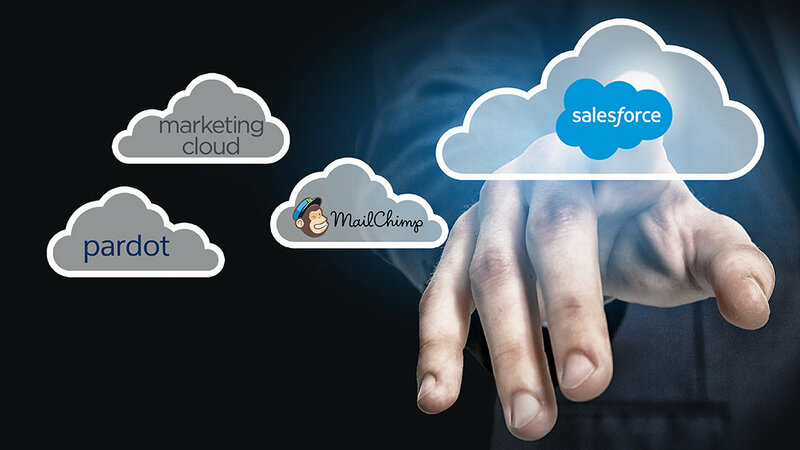 Salesforce bought ExactTarget and made it Marketing Cloud then has continued to buy other companies that do specific marketing-related features to add it to the Marketing Cloud platform. Marketing Cloud is an advanced system where you can write code to meet complex business requirements. This means you usually need a good Marketing Cloud Consultant by your side. It is like Salesforce in the way that you can configure Salesforce to do anything. Marketing Cloud covers all your usual email marketing and marketing automation needs. Engage with people on Facebook and Twitter. Bringing those conversations into Salesforce and being able to reply in Salesforce. Manage of other social media like scheduling a Facebook or Twitter post to go out at the same time you send an email blast. Engage with people via text message. Sync your Contacts into Facebook, Twitter, and Google AdWords and set up a campaign to display ads directly to your synced Contacts. Great for targeting and paying for only your audience. This feature is known as Advertising Studio. Crawl the internet websites, Facebook, Twitter, etc. to see who is talking about your brand and what they are saying. Good for researching how people feel about your brand or doing market research on what people are talking about by looking at keywords that are related to your industry. Pardot is a very user-friendly email marketing platform and looks great in the UI. The feature set is more limited, which also means it is less complicated to use. If Pardot meets your needs it would be our recommendation. Has all the usual features for email marketing and marketing automation. The Salesforce integration is great. Pardot is owned by Salesforce. You need to be careful about syncing your whole Salesforce database if you have a limited number of subscribers. Salesforce starts you at 10K and you pay extra for more. Typically we recommend syncing all contacts and leads from Salesforce to Pardot, but if you have budget constraints or don’t need to have everyone in Pardot you can optionally be selective about which contacts to sync. A unique feature of Pardot is to set scoring based on the engagement of a prospect and use the score in your automation and campaigns. Typically this lead scoring feature is used to gauge engagement of a lead until it is considered qualified and then synced to Salesforce to then be contacted. Website activity tracking is the best of the group. Social Posting: Facebook, LinkedIn, Twitter. Allows to schedule a post and then view details after it has been posted to social media (clicks, unique clicks, retweets, replies, comments, likes). Pardot forms are limited in their function. They are designed to capture new leads/contacts and aren’t designed for having existing contacts fill out multiple forms over time as each form will overwrite the data about that prospect. Form Assembly is a better solution if there is a need for that and it can still send form data back to Pardot. MailChimp is very user-friendly and a lot cheaper than Pardot and Marketing Cloud. A lot of small businesses use MailChimp. Recently, they added marketing automation features to their platform which makes it possible to compare with the other options listed here. Previously they were just considered for email marketing only. They are not owned by Salesforce. The marketing automation features are new and have a lot of good abilities but have some limitations depending on the use case. They have a lot of integrations with other platforms like e-commerce platforms. They have the best email template builder. Unlike Pardot, Mailchimp does have a lot of other features for connecting to other channels such as Facebook for audience targeting and Instagram ads. You can send a limited amount of mass email from Salesforce for any mass email. 5000 per day. In order to schedule an email to be sent, you must use process builder and base the schedule off changes to a record and using a date/time field. Email Opens can only be tracked if using the mass email feature in Salesforce under Leads/Contacts. This feature will not work with emails sent from workflows/process builder. You cannot track click-through rates for your emails. You can track this statistic though using Google Analytics, but won’t be specifically tied to a person. Using our Email Open Tracker app, you can automate and report better on email opens. You can configure a drip campaign, drip program, or marketing automation by using Process Builder or Workflows. You can set up a series of emails to be sent on a schedule and based on conditions. Emails sent via workflow/process builder cannot track email opens. Bounced emails are recorded in Salesforce and can be used. You need to build automation or reports to use this information in their respective filters. There is not a standard unsubscribe function with Salesforce when sending emails. You can send emails without an unsubscribe link for alerts but if you are doing email marketing this is required. You can build an Unsubscribe Form fairly easily using Form Assembly and link to that. Salesforce doesn’t have any great email template builder but you can build your email template elsewhere, convert it into HTML, and then paste that into email templates. There is no tool to check your email template compatibility in different browsers. You can test elsewhere or test manually. Looking to Implement Email Marketing with Salesforce?